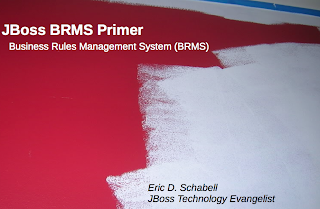 We bring you a new installment for the JBoss Business Rules Management System (BRMS) Primer series. This guide will get you up and running with this product, to run a demo, kick start a Proof of Concept (PoC), or just to let you explore the use cases that these products can cover. The main tool for teaching you about what this product can do will be the example demo projects. These projects attempt to tackle a simple aspect and not become complicated vertical solutions. They are self contained, requiring only that you can clone a repository using git and that you download the products required for the demos from the Customer Portal ( http://access.redhat.com). The following demos are available for your use. Cool Store Demo (eschabell/brms-coolstore-demo · GitHub), online shopping web app, showing CEP, decision tables, rules, and workflow integration with web app. BAM Dashboard Demo (eschabell/bpms-bam-dashboard · GitHub), standalone demo of the Business Activity Monitoring (BAM) component from JBoss BPM Suite. BAM Dashboard in the Cloud (eschabell/openshift-bpm-bam-dashboard · GitHub), standalone demo of BAM component from JBoss BPM Suite running on OpenShift. Home Loan Integration Demo (eschabell/homeloan-integration-demo · GitHub), SOA-P integration with BRMS, web services, esb, rules, BPEL, BPM. Web Process Designer in the Cloud (eschabell/openshift-bpm-process-designer · GitHub), standalone demo of process designer from JBoss BPM Suite running on Openshift. Car Insurance Demo (eschabell/brms-car-insurance-demo · GitHub), part of the 6 product demo, extracted for repeatability. There are a myriad of blogs and video content that can be found around BRMS and BPM, so here is a list of sites to check. I hope you enjoy this material and can have some fun getting started using JBoss BRMS.